These meteors are visible over the entire northern hemisphere and the southern hemisphere down to where it remains light around the clock. The best vantage point lies along the 30th parallel of north latitude, where the radiant passes overhead, usually between 01:00 and 02:00. There is not much change in rates the further north you go until you reach the polar regions. In the southern hemisphere rates fall precipitously the further south you are located due to the lower elevation of the radiant in the northern sky. In December, the Geminid radiant lies nearly opposite the sun. Therefore, Geminid meteors are visible all night long from the northern hemisphere. In the southern hemisphere the radiant rises much later and is only above the horizon for a limited time (depending on your exact latitude) before the break of dawn. The Geminids seen during the early evening hours are long and slow moving. The reason for this is that the Earth is just beginning to face toward the incoming meteors. They are just able to skim the upper portions of the atmosphere so they last longer in the thinner air and tend to create long paths in the sky. As the night progresses the Earth turns more directly toward Gemini and the meteors strike the atmosphere more directly creating shorter and quicker meteors, at least to our eyes. In fact, the Geminid meteors strike the Earth with the same velocity no matter what time it is. It’s our perspective from the ground that makes it seems that they change speeds and lengths. The Geminids are produced by the comet/asteroid known as 3200 Phaethon. This object is classified as an Apollo asteroid but often acts like a comet by ejecting dust when it nears the sun. The Earth is near the orbit of 3200 Phaethon during the first three weeks of December. It comes closest to the core of the orbit on December 14th each year. This is the date most Geminid meteors are encountered and seen. When the Earth is near the edge of the orbital debris of the asteroid, little activity is seen. Unlike most meteor showers, the activity curve is asymmetrical. The climb to maximum activity is slower than the fall. Geminid activity is impressive for several nights prior to maximum but drops off quickly after December 14th. To best see the Geminids you need to view as close to December 14th as possible. In 2018, the waxing crescent moon will be present in the evening sky. Geminid meteors can be seen with the moon in the sky but it is advised to keep your back to the bright moon so that your eyes can adjust to the darkness. 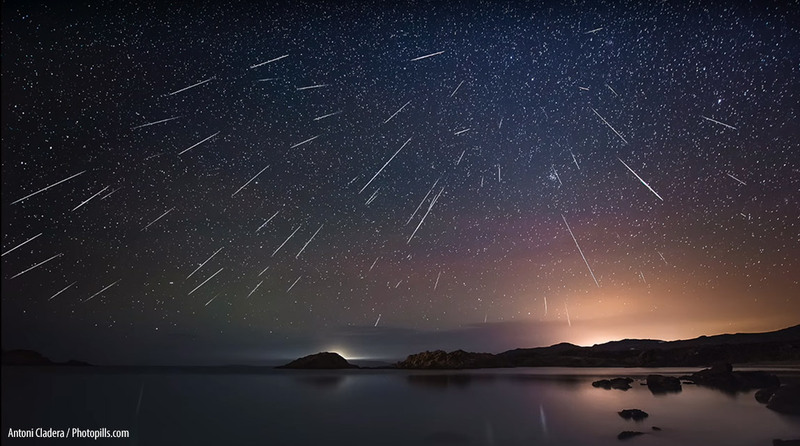 Like all meteors showers, there are many more faint meteors than bright ones. Eyes that had just stared at the moon or just came outside from indoors will not be able to see these fainter meteors. Give your eyes time at adjust to the darkness. It is also advisable to watch for as long as possible as meteor activity waxes and wanes throughout the night. There will be periods when little activity is seen and then other periods when meteors are falling constantly. These periods often last as long as 15 minutes so it is advisable to watch for an hour or more so that you witness several peaks and valleys and get a real feel of the meteor activity. Radar images of near-Earth asteroid 3200 Phaethon generated by astronomers at the Arecibo Observatory on December 17, 2017. The 2017 encounter was the closest the asteroid will come to Earth until 2093. In order to view for that long, you need to be comfortable so a lounge chair is recommended. Lie back and view at a 45 degree (halfway up) angle to see the most activity. In the northern hemisphere be sure to have a blanket or two as December nights can be frosty. You can face in any direction as Geminid meteors can be seen in any part of the sky. No matter what part of the sky they appear, they will all trace back to the radiant near the bright star known as Castor (alpha Geminorum). As stated before, if the moon is above the horizon, keep it out of your field of view. You don’t have to know where Castor is located, but you will soon learn as meteor after meteor will shoot forth from that direction. Another item you will discover is that not all meteors will be Geminids. 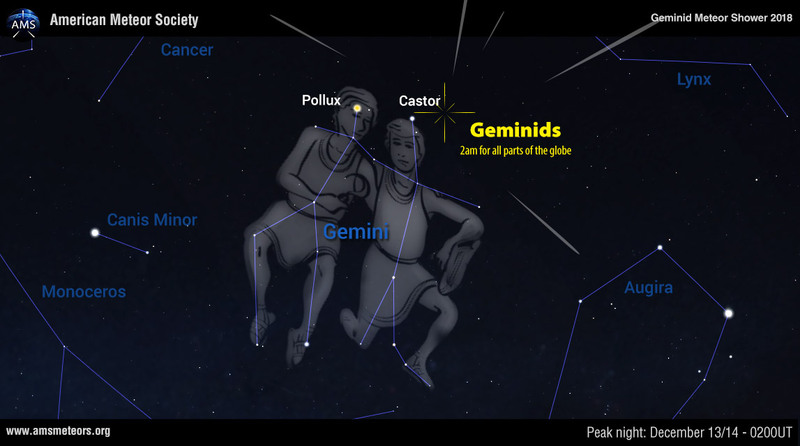 You will see some meteors, both faster and slower than Geminids, travel toward Gemini and in many other directions. Most of these will be random meteors that don’t belong to any recognizable shower. Some of the others will belong to minor showers that produce only a few meteors per hour. Below is the summary graph of automated results of the Geminids 2018 observation campaign, based on visual observations reported by citizen scientists through the online report form of the International Meteor Organization (IMO) built by the AMS. Lastly, you may wish to try and photograph the meteor activity. The Geminids are perfect subjects as the brightest meteors are often colorful and their slower speed allows more light to be recorded. You simply need a camera that can take time exposures in the range of 1 to 10 minutes. The darker the sky, the longer the exposure can be without being washed out. Stars will be pinpoints in short exposures but will trail across the frame in parallel paths in exposures exceeding a minute. Meteors will appear as straight streaks across your frame, often crossing star trails. We hope you will attempt to view the Geminids, one of nature’s best light shows. We encourage all observers, regardless of experience, to share their observations with us! The peak is supposed to happen 01:00 to 02:00 in what time zone?? It does not matter, the most activity will be seen between these hours wherever you live. Normally its between 12:30 am and 2:30 am in all timezones, CT as well.